This short article on the role Glenbuchat played in scientific research into environmental topics such as 'acid rain' in the 1970's and 80's was written by Dr. Tony Edwards (now professor), formerly of the University of Aberdeen's Soil Science Department. At the time, in the mid 1980's, I was planning a booklet on Glenbuchat and its history (which never came to pass). Technology has moved on, and this excellent web site on all topics related to the glen is the natural home for it to reach a greater audience than possible by the printed word. An essential part of the scientific study of ‘practically’ orientated subjects such as agriculture and forestry and their related disciplines is the requirement of good field sites. Aberdeen University and local Research Establishments (such as the Macaulay Land Use Research Institute) are extremely lucky in this respect. 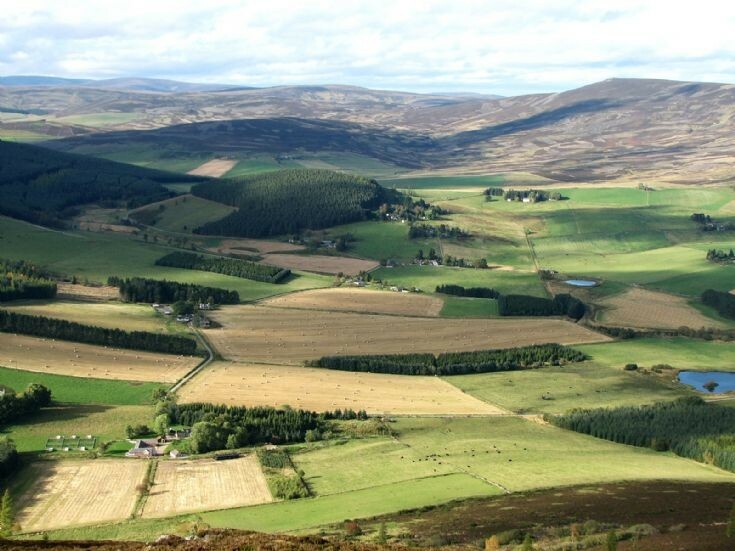 A considerable range of soil types with a mixture of both natural and managed (agricultural and forestry) land use, exist within a close proximity of Aberdeen. Glenbuchat and its surrounding are such as Greenhill on Nochtyside has provided excellent field sites for a large number of research students. It is also visited annually and discussed as part of undergraduate degree courses. In particular the Department of Plant and Soil Science, University of Aberdeen has ‘adopted’ the Glen, with more than 20 individual research projects based in the area during the last few years. The subjects studied have been wide ranging and include upland grass production, land capability assessment (and in particular for forestry), soil development (pedogenesis) and soil/water chemical interactions. A considerable amount of work has also been carried out on the rather unusual soil formed from serpentine found at Greenhill. Students from many countries have ended up wandering over the hills, digging holes and taking those precious little bags of soil (back to the Lab. for analysis). The fertility of the soil is naturally good with land use in the Glen showing a rapid transition from productive arable cropping on the lowland to open moorland or forestry. This indicates that climatic and access/cultivation difficulties are the major constraints upon agriculture. Why is Glenbuchat regarded as such a good field site? Many reasons contribute to the high regard in which it is held including the tremendous range of soil types and land use options available (discussed later) over what is a relatively small land area. Perhaps most important is the willingness of local landowners, tenants and keepers to allow access. Our experiments can be long-term and inevitably cause some degree of inconvenience to the local residents. The site at Peatfold where I was involved, for example, has been studied for more than 10 years. The results from this project have made a very important contribution, on a national scale, to our understanding of environmental concerns such as acid rain. Such major field study projects require considerable initial planning and can involve the use of expensive equipment. From this point of view site security is particularly important. We have been very lucky the only vandalism experienced at Peatfold has been from the local rodent and bird population who seem to find our tubing and boxes extremely interesting. Sometimes our equipment can draw considerable attention from passers-by. At Glendye, on Deeside, for example where a similar experiment existed, a calling card was actually left in one of my boxes giving an address and phone number of somebody in Aberdeen who wanted to know exactly what we were up to. Walkers also seem to be extremely conscientious; again at Glendye our blue rain-binds were often found full of chocolate wrappers, empty cans and half chewed sandwiches. the people using these ‘litter bins’ must have taken considerable detours from usual paths in order to find them. Perhaps I should try to explain the reasons behind our work. It all started in the mid 1970’s when our then Head of Department, Joe Tinsley, suggested it would be interesting to compare the composition of the Rivers Dee and Don. It was thought that the differences in soil type and land use between the two areas would greatly influence each river’s chemistry. A comparison has been made once before, amazingly in 1852, by a Professor in Agriculture at the University when there was some concern over lead levels in Aberdeen’s drinking water. it was decided, however, quite wisely, that the Don and Dee were a wee bit too big to cope with and understand fully. Smaller representative areas were subsequently chosen, Glendye for the Dee and Peatfold for the Don. the soils were different in their nature and origin between sites, Glendye had nutrient poor ones while Peatfold’s were more fertile. The reasons for this variation relate to the underlying rocks which breakdown to form ultimately the soil we see. Once the sites were picked they had to be instruments. We needed to measure the amounts and chemical composition of both the rainwater falling on each site and the river water flowing away. A number of rain bins were set out at each area to sample the rainwater. Gauging the rivers is more difficult, but fortunately a device was already in place on the Water of Dye, maintained by the Regional Council. At Peatfold there was nothing, so the Engineering Department was asked to design something suitable. This they did, very successfully as the flume is still in place more than 10 years later. Hill burns like Peatfold react very swiftly to rainstorms showing an increase in flow rate, rather than rise in water level. The flume reverses this pattern, slowing the flow and causing a proportional increase in water depth. This then enables the flow rate to be calculated. A float in the flume moves up and down in respect to changes in stream depth. the pen attached to this float traces a continuous line on a revolving chart which is changed every week. The relationship between height of the float and the flow rate of water was determined at the University before the flume was put into the burn. Over the years we have collected nearly 300m of these charts which all have been measured to show the variation in river flow. The amount of water flowing from the 200 hectare Peatfold area during a year is about . Water samples were collected weekly from various points along the burn for our chemical analysis. The chemical composition of river water shows a considerable dependence upon where in the soil the water is draining. During rain storms for example a lot of the water only passes through the upper acidic peaty soil layers. As a result spates tend to be more acidic and are often a rich brown colour due to the dissolved peat. it is thought the acid components of industrial pollution which fall in rainwater add to this ‘natural’ soil acidity. The reasons for the importance of this acid rain relates to its effect on the plant and soil communities and ultimately river water. As a soil becomes more acid undesirable substances such as serum are released which can retard growth. It is short-term rapid changes in river pH associated with rainstorms and snowmelt which can under certain circumstances be detrimental to aquatic life such as young salmon and trout fry. Automatic samples have been used to collect water on a regular basis through storm events. The samples were powered by 12V batteries which require frequent changing. Sample collection was triggered by a float switch in the flume which made contact when a particular burn height was reached. Our weekly trips to Glenbuchat tended to develop a set routine which usually started with a hot steak pie and pint of milk from Jack Coopers in Alford. This gradually developed into what became a thriving bakery delivery service for friends back in the Department. Thursday was our main sampling day and for some reason it always seemed to rain or snow on that day each week. Glenbuchat is the only place I know where the rain seems to defy the laws of gravity and actually comes upwards at 40º into your faces. These exposed field sites are notorious for giving a variety of equipment problems and we always had a big bag of spares just in case. No matter how many times we made that journey something always seems to have been forgotten, left behind in Aberdeen. During one especially mad period we decided to dash out and collect river and rain water samples whenever it started to rain. This seemed to be a really good idea on paper, but perhaps in reality it wasn’t one of our better proposals. For comfort we picked the mini-bus which soon became stuck up the track. I decided to be a hero and walk down to get a tow leaving Malcolm, my rather wet supervisor with the bus. Half-an-hour later I was sitting in a neighbouring house with a cup of tea, cheese and biscuits awaiting for the tractor to arrive. Malcolm Cressor my supervisor still thinks I had been wandering around for over an hour trying to find someone, he knows the truth now. Perhaps the worst thing we did was forget that the land rover was petrol and filled it up with diesel instead which caused a few problems. You might be wondering if we ever did anything right. Well we did, and have published a book and chapter for an American book along with over 20 scientific papers on our work at Peatfold. Results have also been presented at meetings all over Britain and even abroad as well. I should point out that none of this would have been possible without the fantastic support shown by all the Department’s technical staff. In particular Bruce Gordon has never said ‘no’ to a Peatfold trip irrespective of weather conditions or time of year even making a run up on Boxing Day. The workshop team has also been great; most of the bought equipment requires modifications to suit our needs. They have built various items from scratch and again never say ‘no’ to a trip out. Finally, I should like to thank all the people who have been so generous in giving permission to work on their property and also for their valuable time. In particular Major Smiley and Mr. Tulloch, Mr. and Mrs. Goodfellow who used to be visited once a week for the meteorological data they collected, and Mr. Hector McNeil for always saying ‘yes’ to my phone calls during the shooting season.